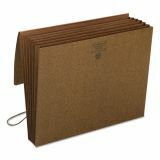 A favorite among attorneys, accountants and bankers for transporting or storing documents. Double-thick front and back panels for added durability and longer life. Flap with elastic cord closure for extra security. Note: A minimum quantity of 10 must be ordered, and in units of 10 thereafter. Smead 5 1/4" Expansion Partition Wallet, Cord, 6-Pocket, Letter, Redrope - Leatherlike Tyvek Portable Expanding Wallet keeps paperwork sorted and protected for easy transport. Features six pockets for easy subdivision of contents. 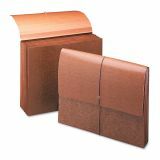 Protective flap, sides and bottom are reinforced with durable Tyvek material. Expanding wallet offers an elastic cord closure for added security of contents. 5 1/4 expansion."